I recently had the good fortune to be invited to stay with my friend Anne in Devon, specifically Dawlish on the south coast. For those unfamiliar with English geography, Devon is a county right down in the south-west of the country; only Cornwall is further to the west. Devon and Cornwall used to be independent from England for hundreds of years and even have their own language: Cornish. However, these counties are also among the most popular holiday destinations for native Brits and foreign holidaymakers. So this got me wondering: just how typically English is a holiday in this region? Well, for a start, rain was forecast for every day of my stay. Very typically English! But the weathermen were wrong and in fact I enjoyed sunny weather which was unseasonably warm for April. Hmm, not so typical. This was a real stroke of luck, as having resigned ourselves to epic Monopoly games in the conservatory, instead Anne and I were able to venture outside and explore. 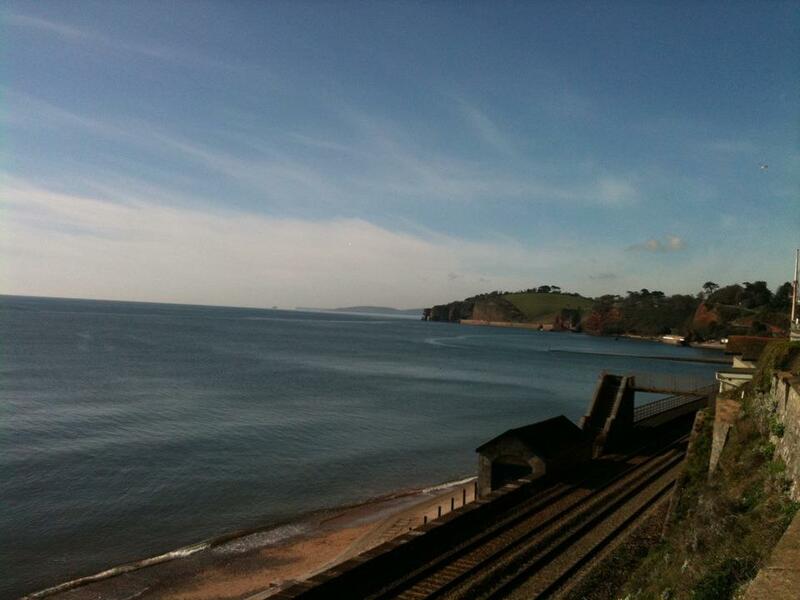 Our first stop was a walk along Dawlish beach, surrounded by various dogs and their owners – lovely! Anne reckons almost everyone in Devon owns a dog, and as we were dog-sitting a border terrier, ‘Alfie’, for the week we joined in the sea-splashing fun. The beach here is pebbly which means the sound of the waves crashing on the shore is loud and very peaceful. After a healthy dose of sea air we retreated inside for a dinner of cottage pie and baked beans – English through and through! The next day began with a cup of tea on the patio, overlooking the sea and listening to the waves – there is probably no better way to wake up in the morning. 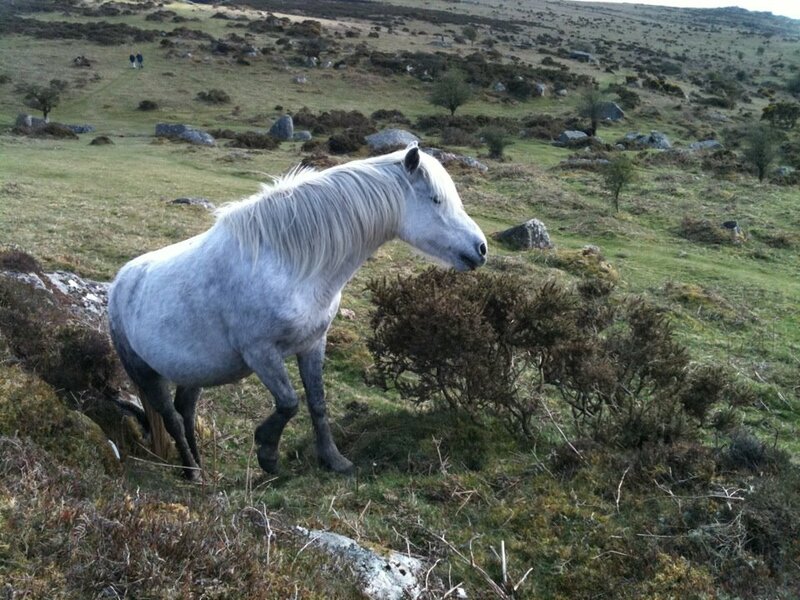 We journeyed north to Dartmoor National Park. Wildlife spotted here included pied wagtails, skylarks and the wild horses that live on the moor. 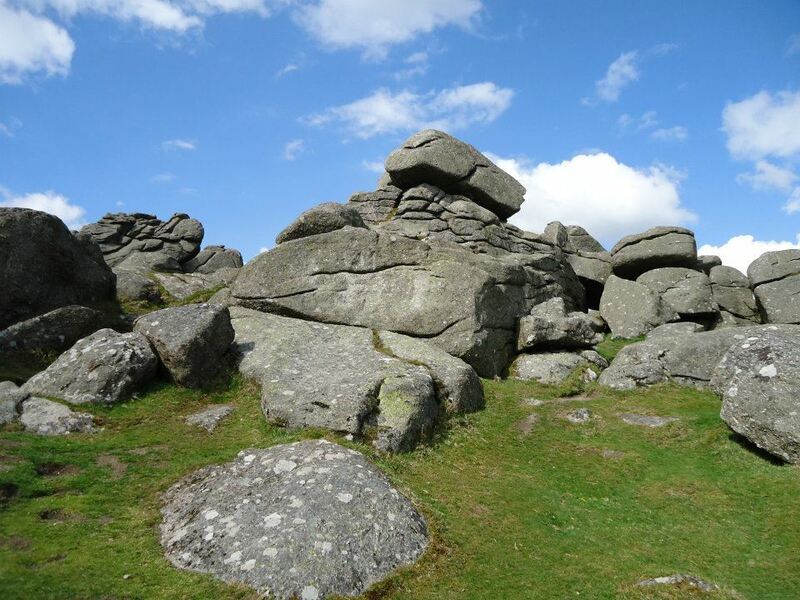 We channelled our inner mountain goats to climb one of the huge stone tors that are found all over Dartmoor, a result of the erosion of granite rock. Our reward was a Cornish pasty and locally-caught fish & chips! On my last day of beautiful sunshine we headed into the city of Exeter. Down at the Quays we looked around shops selling beautiful handmade glass and metal-work, wishing we were rich and could buy everything. 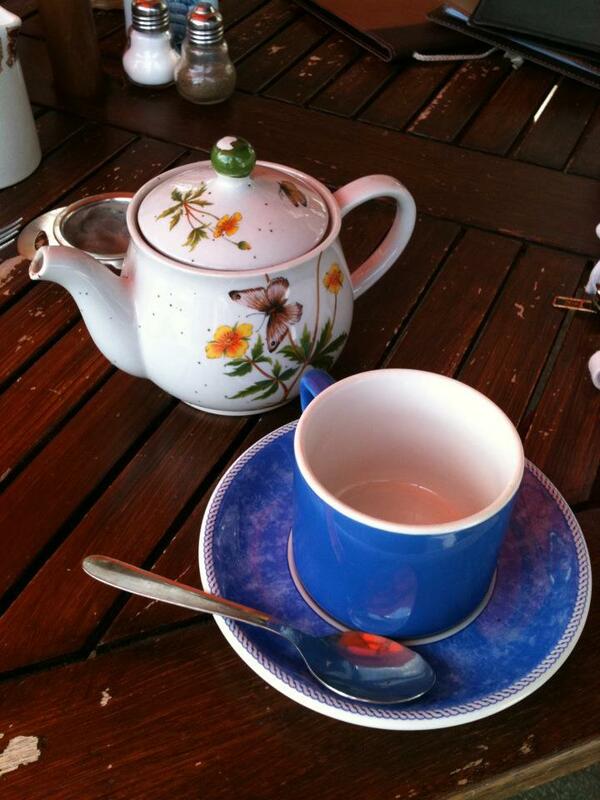 A friend of Anne’s had recommended the café Jolly Rodgers for afternoon tea – it would be rude not to! Sitting outside in the sunshine (not often a possibility in this country) we feasted on sandwiches and scrummy scones with thick clotted cream and three types of homemade jam – strawberry, blackcurrant, orange & ginger. Topped off with a pot of Earl Grey tea, we could feel ourselves slipping into a food coma so legged it back to the car and took the scenic route to Dawlish, enviously admiring quaint cottages all the way. It had been a beautiful and relaxing few days in Devon. I loved getting back to nature taking walks on the beach and in the countryside, eating well and hearing the sea first thing in the morning. The verdict: I’d say Devon was about 95% quintessentially English. 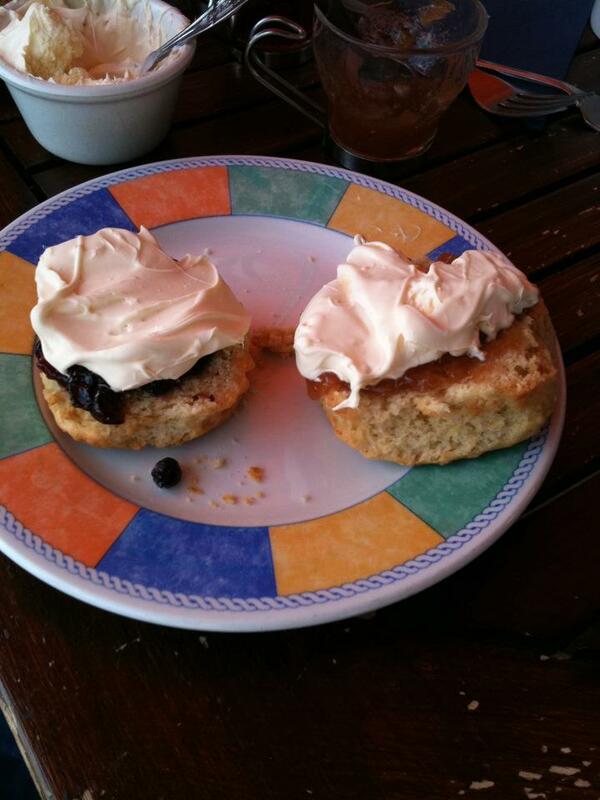 Tasty treats like a proper cream tea or Cornish pasty enter a different league of yumminess in the southwest. More importantly, the warm and sunny weather was nothing like your usual April in England. I guess we all get lucky sometimes!